I was lucky enough to get my hands on some of the brand new Eyeko products last week, and to demonstrate them I hosted a 2-day takeover over on their Instagram account - and now I can show the images here, too! 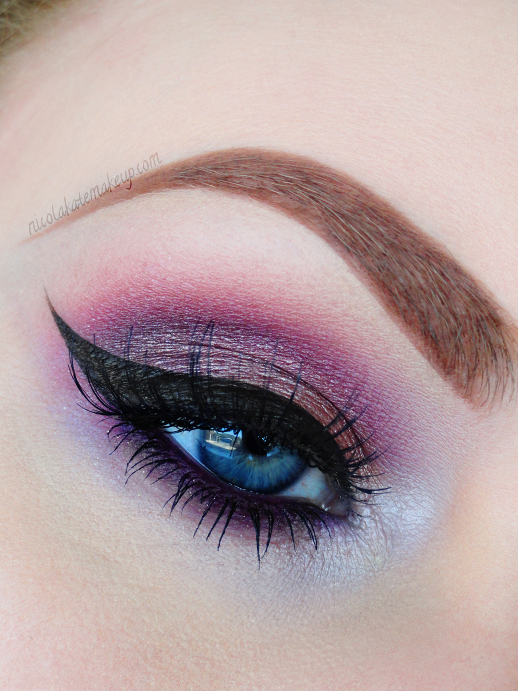 This look demos their Visual Eyes Liquid Eyeliner in 'Mocha', which is a rich brown shade. I'm really liking this colour as it still gives the definition that I love when it comes to my winged liner but is slightly less harsh than a black, which makes a nice change for me. I also find that browns are really flattering on blue eyes. Unlike Eyeko's previous eyeliner, the Visual Eyes liners come with a SUPER precise, tapered brush tip rather than their usual felt-tip style applicator. The small size of the brush tip enables very thin lines to be created but building up thickness with it has still never been so easy. I also made good use of their new Making Eyes Automatic Gel Eyeliner in 'Plum', which I placed along the lower waterline and lower lashline. The Making Eyes liners are a twist-up pencil eyeliner that set into place and I was really excited to see Eyeko branching out and adding more kinds of products to their range, as Eyeko are best known for their mascaras and liquid eyeliners and I can't wait to see what other products they'll muster up in the future! I thought this look would be perfectly timed for the current prom season, and the upcoming UK prom season, depending on how thick and winged out you like your eyeliner!